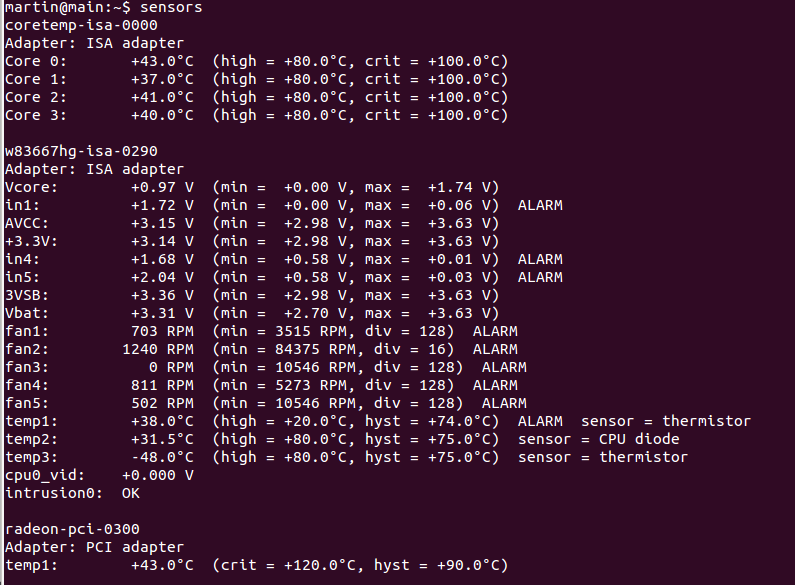 On my desktop computer, I am able to control the fans under Windows using software provided by the motherboard manufacturer, but it is not obvious how to do this under Ubuntu. There are various articles around on the internet, but this has been a constant problem for me so I thought I’d collect together all the info I need to provide a reference for the future. Maybe this has arisen because my desktop PC hardware is 4 years old and newer motherboards are better integrated with modern Linux, but this is what I needed to do to solve this problem. Caveat – if you’re not comfortable running your PC without fans for a time, don’t bother going any further. I don’t think this is particularly dangerous, but some might. When I first bought this computer, the manufacturer hadn’t attached the CPU cooler correctly and I ran for a while with the cores permanently throttling themselves at 100 degrees. The values shown below are after correcting this and replacing all the fans with high-end quiet versions (except the power supply). This identifies the kernel modules that can monitor the speed of the fans and the temperature of the cpu, motherboard etc. I answered yes to every question including the one where it does the update to the kernel configuration file. You can see the additions in /etc/modules. 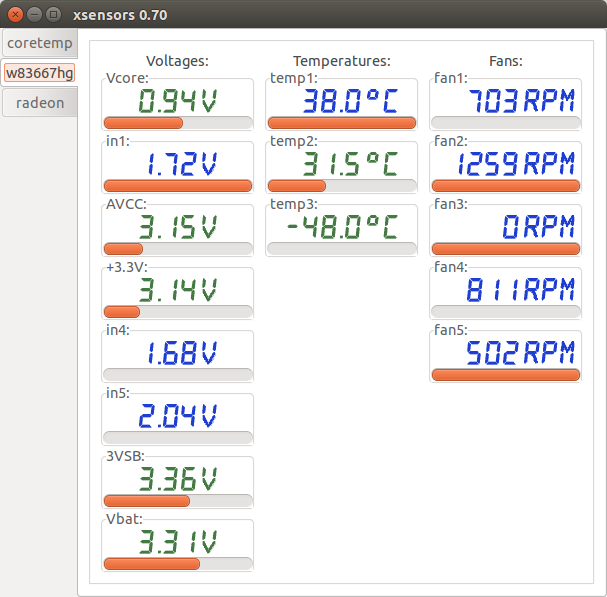 Here coretemp shows the cpu temperatures and w83667hg shows motherboard information such as fan speeds, temperatures and voltages. If you run the command twice, it will put the drivers into /etc/modules twice. Devices – these are the bits of hardware that can have monitoring capabilities – as shown earlier, coretemp = cpu, w83667hg = motherboard and radeon = video card. PWM controls – these are the devices that can control fan speeds using pwm. Pwmconfig will cycle through each one and see if any of the fans has had their speed changed. For those that don’t know, pulse width modulation (PWM) is a way to use a digital output to control an analogue device. 255 represents fully on (power rail value e.g. 5v), 0 represents ground (e.g 0v). For an intermediary value, it represents the percentage of time that the high value will be on the output – so 150 would mean (150/255) * 100 = 59% of the time. The speed of update of the pulse is much faster than the analogue device can handle so it treats it like a lower voltage – in this example it would effectively be 5v * 59% = 2.9v. Fan sensors – these devices can be read to give the current fan speed. These values should also be shown dynamically in xsensors if you have it running. 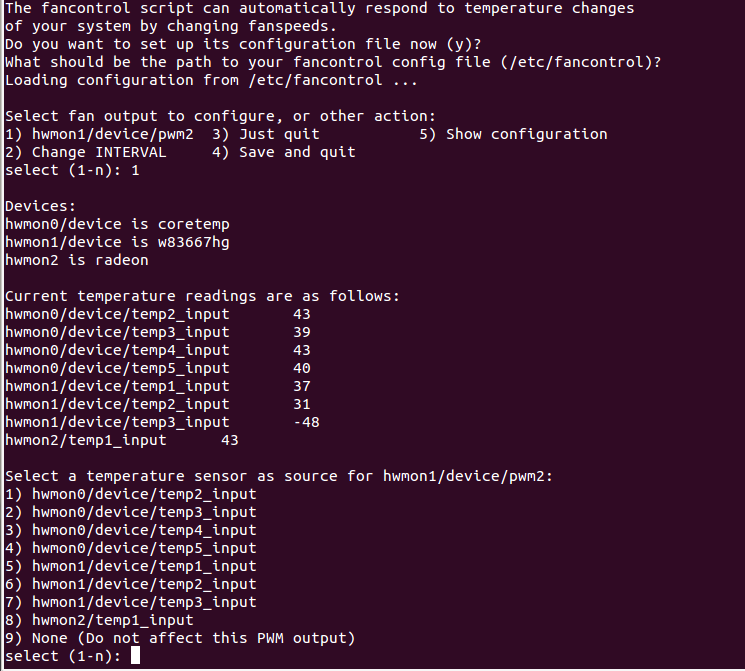 Using this ability, you can find out which fans your pwm devices are able to control. In my situation, I can see that only pwm2 controls any fans, and they are fans 1, 4 and 5. Fan 2 has no ability to be controlled. Pwm1 and pwm3 do nothing. I have 3 case fans and 1 cpu fan, maybe if I figure out which fan is not able to be controlled, and then connect it to the unused fan3 control, I could control that with pwm2 as well? Pwmconfig does this analysis in a more rigorous way, but I found it easier to do this myself to really understand what was going on. This also allows you to figure out good values to use. So, back to pwmconfig. Breaking the suspense, it recomments using gnuplot to plot correlations between pwm control values and fan speeds – this didn’t work for me. Instead I had to fall back on the terminal output. While this is happening, it’s also important to listen to how loud the fans are. In my case, the reason for doing this configuration is to reduce the noise made by the fans. I don’t need to actually stop them, I just need to set the minimum speed to a value where the fans make as least noise as possible, while providing the maximum cooling at that noise level. This manipulates each pwm control and then checks through the fan speeds to see if any have been affected. Here, pwm1 and pwm3 are recognised as having no function and pwm2 is identified as controlling fans 1, 4 and 5. Using the detailed correlation and acoustic monitoring, I found that as soon as the pwm value descends from 255, the fans slow and the volume starts to decrease. When it reaches 150, I can no longer hear any change in volume as the uncontrollable fan 2 becomes dominant. Possibly if it wasn’t there, I could go further. And then choose 4 to save the values. Well, these do exist and they are correct, so this may be a configuration syntax issue. I don’t think it really matters that 1 or 3 fans is controlled by the same parameter, the action of the system to increase pwm2 when the temperature exceeds 50 degrees Celsius should be the same. Trying fancontrol again and it works! Now all we need to do is make fancontrol get started when the system starts. Checking /etc/fancontrol, there is already a script for this, so should all be ok. Test by rebooting and in the middle of the ubuntu initialisation screen, the fans go quiet! Let me know if you have any luck with this or if I’ve missed something. Here’s to a quieter future for all. Error: file hwmon1/device/pwm2 doesn't exist. Secret Rabbit Code Upsampling – Digital Audio Done Right! 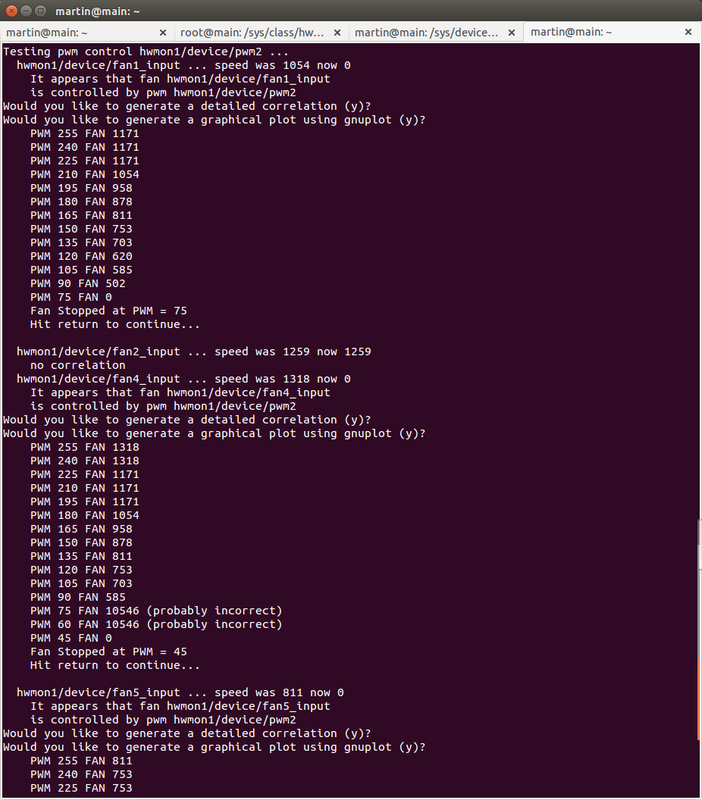 Upgrading Ubuntu from 32 bit 12.04 LTS to 64 bit 12.10. Disk free! Ubuntu Unleashed 2012 – the install!